In the past two weeks, the Crystal Ball has published its first extended state legislative analyses, looking at the 6,115 seats in the state senates and the state houses up in November (in 46 states). Tim Storey of the NCSL identified the chambers that are competitive and thus most likely to switch party control after the elections. Then Prof. Alan Abramowitz applied his well-known congressional election prediction model to the state legislatures, and suggested that Republicans could expect to gain 8-10 chambers and 250-400 net seats in all the states combined. The following map by Joseph Figueroa of the UVA Center for Politics is a visual summary of those conclusions. Obviously, the close Republican-held chambers on the map are much less likely to switch party control than the Democratic-held chambers. 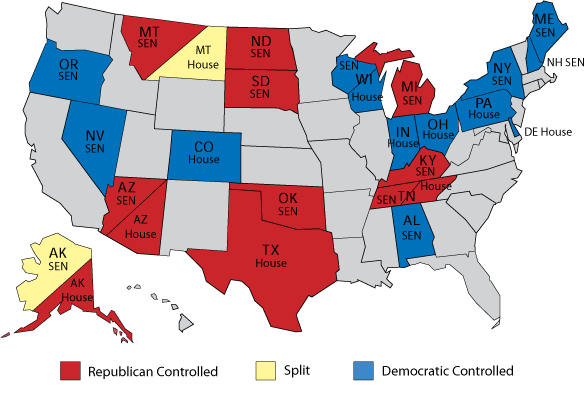 So as we move into the fall, while watching them all, our eyes will naturally gravitate to the blue states on this map.